The pics on this page are mostly from Annie & Patrick's (non) wedding day in the episode Nice Day for a Dry Wedding. Plus there's an added treat of having the opportunity to listen to Michael Tiernan's song, "I'm Ready" here, as well. So enjoy! Top picture: Annie & Patrick jumping off the cliff - after deciding that they will, after all, get married. Second picture: Annie & her mom, just prior to the wedding. Top picture: Annie & Patrick, getting ready to say their "I do's" - can you see what's happening? Bottom picture: Patrick wakes up in the hospital with amnesia. After being struck by lightning, he has no idea who he is, let alone who anyone else is. 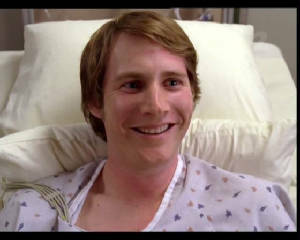 While Parick is in the hospital, Sam asks Jane to marry him. Would you like to listen to Michael Tiernan sing "I'm Ready?" Well, then click the link below & I hope you enjoy it!!!!! I know I did! From that same article Men of Men in Trees (April 2007) we have an article about Patrick Bachelor (Derek Richardson) – Responsible for running Elmo’s guest inn and the local radio station, Patrick is sweet, innocent and demonstrates a solid measure of goof. In bringing Marin to Elmo he sets in motion a series of related events that impact significantly on his own life. Finding happiness with Elmo newcomer Annie, he is finally stepping out from his mother’s shadow and following his own path. I thought it might be neat to listen to a song that was played on an episode, so I contacted Michael Tiernan (sometimes I get bold) & the next day I received a reply from him. He told me it would be great if I could put a link to his song, "I'm Ready" on the site. And so that's what I did! 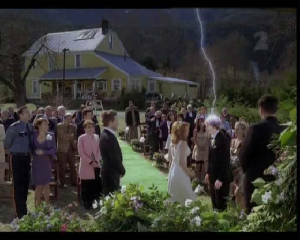 He says, "The episode the song was in was "Nice Day for a Dry Wedding," the second in the two-parter. They used almost the whole song at the top of the show, when Annie and Patrick were re-committing to their marriage and jumping into the water off that rock, and into the scene when Sara and Eric wake up together in the morning." So when you're finished checking out the fan site, feel free to go to his web site at: www.tiernantunes.com. On his site, you will be able to read his bio, as well as hear more snippets of songs. The song is NOT streamlined, meaning you will only hear it IF you click the link and it only runs for 3-1/2 minutes, but you can listen to it over and over, if you wish (as I did). So don't miss this opportunity to listen to his song, I'm Ready, and sing along (because the lyrics are there, too) because I'm sure you'll like it as much as I do!